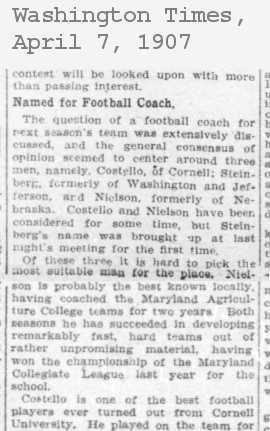 1902: Nebraska wants to schedule a road game at Iowa for Nov. 15th but is rebuffed. The Cornhuskers would settle instead for Knox at home, and Iowa would host Washington University of St. Louis. 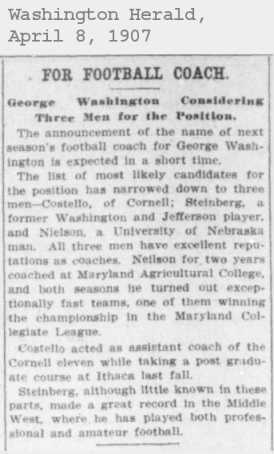 «1907: Fred K. Nielsen, a halfback for the 1900 Cornhuskers, emerges as a top candidate for the coaching job at George Washington University. Nielsen would indeed get the position, his second of four college coaching stints. 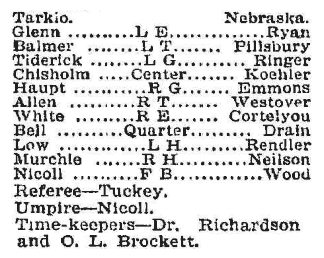 According to box scores from 1900, the Danish-born Nielsen started at right halfback for the Cornhuskers against Tarkio and played in two other games as a backup. He earned law degrees from NU and Georgetown, and after World War I he would become the U.S. State Department's chief legal officer. 1922: Planning is under way for financing and constructing a football stadium to replace Nebraska Field. 1937: In the year's first major outdoor track and field meet, Husker football All-American Sam Francis sets a Texas Relays record in the shot put and also wins the discus event. 1952: Extra-point tries are the difference as the Varsity edges the Alumni, 7-6, in the spring game. 1957: The Varsity sweats out another close one with the Alumni, 22-20. «1967: Five years and one day after the Hall of Fame announcement, Guy Chamberlin passes away at age 73 in Lincoln.  Also, Big Eight teams have hopes of ending Nebraska's four-year title run as spring practices begin across the conference. 1977: Jim Pillen and Kerry Weinmaster move to the top of the depth chart at monster and middle guard. 1997: Plans for an Aug. 23 Pigskin Classic game in Lincoln fail to pan out. ABC-TV angled for Clemson at Nebraska, but neither school wanted that matchup. Maryland, Iowa, Boston College, Southern Cal, Arizona, Arizona State, Miami, Virginia and California all reportedly were approached as possible Husker opponents, to no avail. The game ultimately was played at a nearly half-empty Soldier Field, where Northwestern beat Oklahoma, 24-0. 2007: Plans for dueling spring golf outings are a sign of fissures in Husker Nation. 2012: The alternate-uniform trend arrives at Nebraska.